Cedefop’s project, which has been running since the second half of 2016, when the Greek Ministry of Labour, Social Insurance and Social Affairs submitted a formal request for support to the agency, has helped provide a comprehensive overview of what policy-makers and practitioners in Greece think about current practices aimed at ensuring effective links between the education and training system and the needs of the labour market. The Greek review focused on identifying suggested actions for further improving the governance of the country’s newly developed Mechanism for labour market diagnosis. The analysis, which also included suggestions for change, was based on a wide consultation of stakeholders, including ministries and their agencies, social partners, research organisations and vocational education and training (VET) providers. 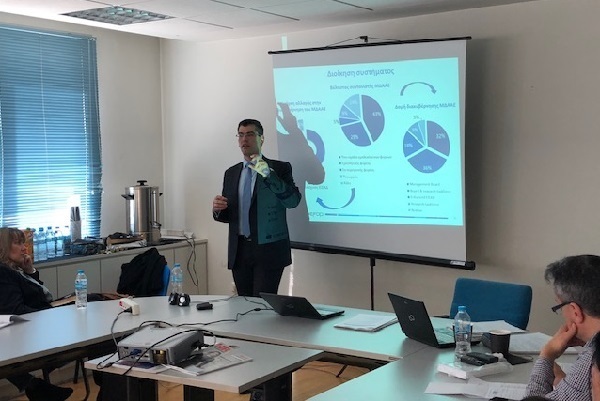 To support Cedefop throughout the project’s duration, a Greek National Steering Committee (NSC) was set up, comprised of representatives of ministries, social partners, OAED (PES) and key research bodies. The meeting’s aim was to present and discuss a draft ‘national policy roadmap’, which reflects findings from all stages of the country review (background report and scoping exercise, in-depth stakeholder interviews, online survey) and, in particular, of the three rounds of the (Delphi-style) consensus-building exercise (CBE), which sought to explore opinions and agreement among key national stakeholders on how to overcome critical bottleneck areas of the Greek skills anticipation and matching system. The final ‘national policy roadmap’ will concern a plan of action and steps that could be followed by the Greek stakeholders in the short, medium or even long-term to improve the existing national skills governance system. Cedefop experts Konstantinos Pouliakas and Stelina Chatzichristou, supported by experts of Fondazione Giacomo Brodolini, presented the key findings of the CBE rounds and the stakeholder interviews that have taken place under the review; as well as good practices and lessons learned so far from the other country reviews that Cedefop is currently running (Bulgaria, Estonia, Slovakia). Overall, Cedefop’s review highlighted the need for reform of the Greek skills governance system along three dimensions: formalise as renewed aims of the Greek Mechanism of skills diagnosis the need to better link labour market intelligence with reforms in active labour market policies and those in VET/apprenticeship system; extend the methodologies used as part of the system towards the development of more ‘consensual-based’ skills foresight exercises, which would enable the collection of in-depth information on changing technologies and skill needs at occupational level; and reconsider the system’s management so as to improve its overall coordination. Cedefop’s work was well received by participants, who contributed in a fertile dialogue. It was highlighted that, although Greece has been making marked reforms in the field of developing tools for upskilling and reskilling workers based on labour market intelligence, more efforts are necessary to harness the necessary political will and commitment that would unlock efficiencies in the system. In the next months, Cedefop will garner more stakeholder views to further improve and validate the ‘national policy roadmap’, before finalising the conclusions of the country review in a report due to be published by the end of the year.